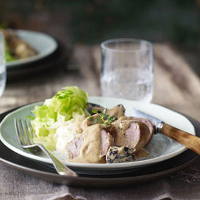 Mix together the garlic, mustard, muscavado sugar and seasoning and spread over the pork fillet. Leave to marinate for 15 minutes. Heat the oil in a frying pan and brown the pork on both sides. Add the prunes, cider and thyme, cover and simmer for 15–18 minutes until completely cooked through. Transfer to a warm serving dish, cover and leave to rest. Simmer the juices in the pan to reduce by half, remove from the heat, then stir in the crème fraîche to create a thick sauce. Check seasoning. Slice the pork thickly and spoon the sauce over top. Serve with creamy mashed potato and shredded cabbage.